82-year old archaeologist Khaled Al-Asaad was beheaded by Islamic State militants on Tuesday in front of dozens of people in a square outside Palmyra’s museum. His mutilated body was then taken to Palmyra’s archaeological site and hung from one of the Roman columns. 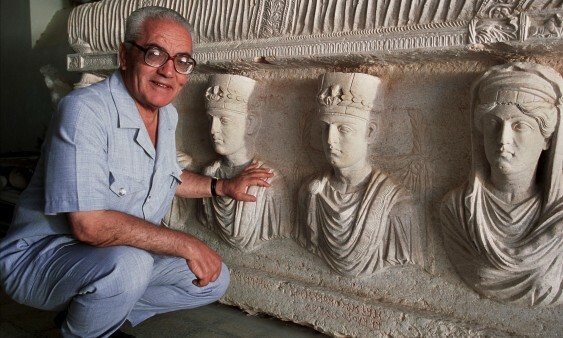 Al-Asaad, a renowned antiquities scholar who has been working at the site for more than 50 years, was interrogated by the militants for a month before being murdered because he apparently refused to reveal the location of valuable artefacts. UNESCO Director-General underlined in a statement issued yesterday that “The Syrian cultural heritage community suffered two immense blows within one week with the murder of archaeologist Khaled Al-Asaad in Palmyra and the killing of the Assistant Director of laboratories at the Directorate General of Antiquities and Museums Qasem Abdullah Yehiya.” “The untimely deaths of Mr. Asaad and Mr. Yehiya are a terrible loss to the cultural heritage community in Syria and globally,” the Director-General added.